HSE Now, SPE’s HSE magazine, has recently featured our Air Qruise™ Electro-Ex. The article describes the challenges posed by sour-gasfield development, specially the toxic and flammable atmospheres created when H2S is released to the surface. As traditional combustion vehicles are not allowed inside these areas, in order to transport personnel and equipment a solution for this scenario must tackle both flammability and toxicity issues, making safety innovation vital to the sustainable exploration of these resources. 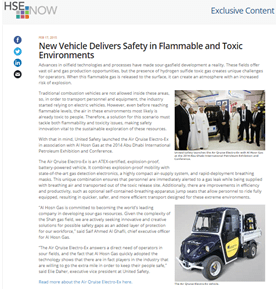 The article goes on to describe the Air Qruise Electro-Ex, an ATEX-certified, explosion-proof vehicle launched by United Safety in association with Al Hosn Gas at the 2014 Abu Dhabi International Petroleum Exhibition and Conference.